Enjoy the bounty of our organic farm families' finest offerings! Two traditional favorites to enjoy on separate occasions, or as part of a show stopping banquet! Each items are variable weight: Organic Whole Turkey will range from 13-16 pounds, Organic Spiral Ham will range from 4-6 pounds. If you have questions about these products, please call 877.662.6328. Turkey: Cooking: Cook to 165 °F as measured with a food thermometer placed in the thickest part of the meat. Remove from heat and serve. Ham:Cooking: Spiral Hams are pre-cooked and can be served cold. To serve warm, remove plastic film. Open foil, remove plastic bone guard disk and replace foil to preserve moisture. Place in the oven at 325-350° allowing 10 to 15 minutes per pound for reheating. Heat to an internal temperature of 140 °F as measured with a food thermometer placed in the thickest part of the meat. Remove from heat and serve. Be careful not to over-heat as the precooked, precut spiral slices can dry out. Quick Thawing Methods: Click here for thawing tips! The ordering process was so easy, customer service was superb. I was able to get my order shipped on the date that I needed it. The quality of the products was amazing. Will definitely order from Organic Prairie again. The bone-in ham was lean and wonderfully smoked. Best ham I have had in years. I will be ordering this again. The turkey was very flavorful. I overcooked the turkey in error and my guests still thought it was wonderful. Although we bought the ham & turkey combo, we have not tried the ham. The turkey was outstanding....the best ever. I didn't even brine the turkey this time, and it came out moist and delicious! Tasted super fresh and knowing it's organic makes me feel good. Both meats were delivered quickly and packaged very well. There were no cooking instructions included so that is something that customers may appreciate. Both the ham and the turkey were delicious. I certainly would entertain another order as we were very pleased with the quality and taste. This was the very best turkey I have cooked since I was a kid on the ranch/farm. Starting with a Thanksgiving turkey, we enjoy always. Moist and marvelous tradition. The ham is great for Christmas, New Year or after...great bargain and great food. I sent this combination of turkey and ham to a number of family members. It was extremely well received! The packaging was excellent . Thank you Organic Prairie for excellent service and a qualify project. Everything I ordered was GREAT. Never compromise your integrity of quality. I will return. My whole family enjoyed this delicious ham for Easter dinner! Thank you for making our holiday so enjoyable. I will definitely order again! thinking doing the package deal we then are given the smallest of the pounds in both the Turkey and Ham. This is our second year of buying a turkey for thanksgiving and ham for New Years. I can't say enough about the quality and taste of the products from organic prairie. There was almost zero fat on the turkey and the meat was outstanding. This year I decided it to order Organic Turkey and Ham out of my state.After 2 weeks online research and price checking, I decided to try out Organic Prairie.I ordered the Holiday Special 1 Turkey 1 Ham .it was the best decision I made . The quality, freshness, taste it was just delightful. Thank you for the healthy experience. This is the third year that I have ordered the turkey and ham special. In our family I serve the turkey at Thanksgiving and the ham at Christmas. Organic is the main reason I started buying, but the flavor, and the tender, moist meat is the reason I have continued to buy. We was looking for something new meat source for this Thanksgiving . After 2 weeks online ,price, feedback research we decided to order from Organic Prairie . I ordered the Holiday Special 1 Turkey and 1 Ham . Shipping and Costumer care is just excellent. The quality of the meat both the turkey and the ham just excellent. Fresh, smell delicious. All my fresh herbs and seasonings builded in the turkey wonderfully because it's no any other chemicals involved raising those birds. Ham as well, I tuned up with some glaze ,baked it for a little. ..came out just mouthwatering. Organic raising it is matter. We are family of 6 and the Holiday Turkey & Ham order was enough till Monday. I highly recommend Organic Prairie. We are very satisfied with the quality. As always, the holidays were made better with organic prairie food. I'm not sure how many years I've been buying the Turkey and Ham duo for the Holidays. It has always been superb. Our family is very spread out and it becomes difficult for everyone to get together for the Holidays. I give the Turkey and Ham duo as Christmas gifts. It has now become a tradition. I have shipped this as Christmas presents as far south as Florida and as far north as Wisconsin. Everyone loves and appreciates the healthy, tasty meats. Great Products. Will always order again. We loved it and will order again! Turkey good size at 14.3 lb. & absolutely delicious; Ham/Turkey combo a good price; Spiral Cut Ham somewhat on the small size but again very tasty. The hard to find thick-cut organic uncured bacon was a little pricey but it was sure hard for all to stop eating it. I live in the 3 day delivery area; and. it took all of the 3 days, but because of the time of the year, everything arrived still frozen solid with some dry ice still intact and that was to here in South Florida. Good tasting and my family enjoy eating both ham and turkey. Thank you. Our thanksgiving turkey was wonderful and so much meat! You can sure tell the difference from store bought turkeys! Our friends were surprised and I gave them the web site to place their own orders. 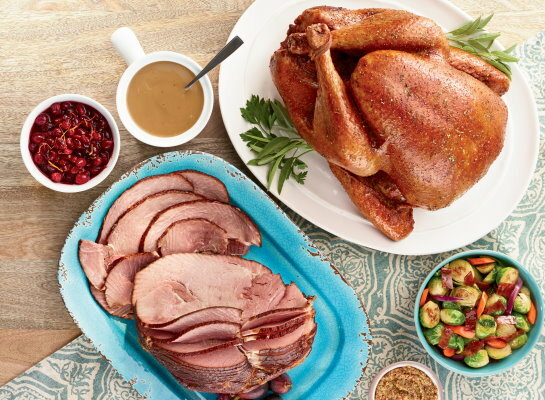 Love this ham and turkey holiday combo! They are now a family tradition in our home. Best organic meats available! Thanks so much! Can't remember when we had a Turkey or Ham that tasted so good!